Frequently Asked Questions - BRIGADOON | Bundanoon Highland Gathering Inc.
On most mornings we have an early fog which rises to reveal the mystical Brigadoon. In fact, we have only had a few occasions in the last ten years when we have had early light rain – the day brightened to pour sunshine on the Highland Gathering. Brigadoon always goes ahead – RAIN, HAIL OR SHINE! How do we find Brigadoon? 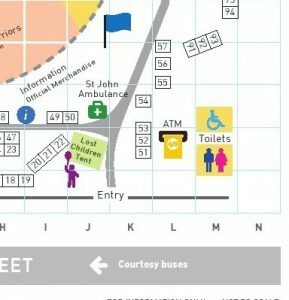 It is recommended that you arrive early, as we are unable to reserve parking even for holders of disabled parking tickets and spaces are allocated on a first come basis. Follow the Parking signs (P) through the Village. We have personnel available to assist the disabled to get to the grounds. How early do I need to arrive to get a parking spot? Car park opens from 6.30am. Just follow the Parking signs (P) through the village. 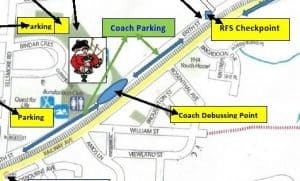 Parking is situated at Jordan’s Crossing which is directly behind the main oval. 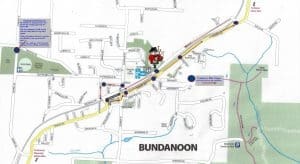 Where does the gathering take place in Bundanoon? 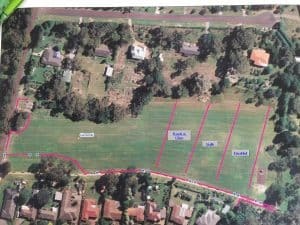 How far is it from Bundanoon Village to Brigadoon oval? Is there a courtesy bus service from Bundanoon Village to Brigadoon? It is the responsibility of the Owner/Carer to ensure that they clean up any mess after the dog and it is disposed of properly. Dogs are NOT permitted near or on the Sand Pit in the Children’s play area. Should owners fail to abide by these regulations they may be asked to leave the grounds. There is very limited seating. We suggest that you bring your own seating or blankets. Can we erect a Gazebo? Where is a good meeting point at the Oval? The best meeting point is at “Fergie” which is our logo and is positioned over the cricket nets to the North of the oval. Is there a lost property/lost children tent? 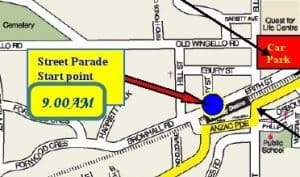 How long does the Street Parade go for? Where will the parade travel from- to? Parade starts junction Amy & Erith Streets and goes to Oval. How early can I get into the Gathering? Coaches and buses park on Erith Street directly outside the oval. Can you buy food at the event? WATER – PLEASE NOTE: The Bundanoon Highland Gathering fully supports the “Bundy on Tap” proposal for stopping the sale of bottled water in Bundanoon, and therefore there will be NO bottled water for sale at the gathering. There are FREE water stations in town and facilities at the oval to fill reusable water bottles. Either bring you own Water bottle or purchase a Bundy on Tap bottle in the Village or a reusable water bottle at the oval. Can I bring my Caravan or Camp? The distance from the pony club grounds to the Brigadoon parking area is approximately 1.5 kms. There MAY be an organised courtesy bus service from the pony club grounds to the Brigadoon Gathering. Whom do I see for a media pass? Where do the bands play? There are Three (3) locations at the oval. Bands play at irregular intervals, for further information all details are contained in the programme which is sold at the gathering on the day.